Quantum-Touch Store "Quantum-Touch: The Power to Heal"
In 1978 just months before my first book “Your Healing Hands” was released, I experienced a first in a series of life-shocks that forever changed my life. While I could hardly believe what I was witnessing, I could not look away or deny what was before me. I attended a workshop taught by Robert Rasmusson. This was the first time he ever showed a group of people a method of hands-on healing that he had intuitively discovered in 1948. Bob (as he liked to be called) discovered this work when he was visiting a young child with a severe case of bowed legs; she would come home crying because the other kids teased her. Asking what he could do to help, he was guided to use body awareness and breathing techniques. Rasmusson then touched the girl’s knees and the bowed legs immediately straightened out. The girl cried out, Mommy, I can touch my knees together. "Quantum-Touch is so well written that many lay people have learned and are using the skills just by reading it. Practitioners of numerous healing modalities use Quantum-Touch because they can seamlessly integrate it into their practice." I heard this and other outrageous stories I deemed to be “tall tales” and was feeling quite skeptical and a little angry until he demonstrated his technique on my friend. Standing in a bathing suit, everyone could clearly see that she had a major S curve in her spine. Bob lightly touched her back, neck and hips. My jaw dropped open seeing her hips immediately shift, seeming to melt into alignment, her cranial bones moved, and in the next 15 minutes her spine all but completely straightened out. I instantly arrived at some compelling conclusions: Bob must have a rare gift; no one else will ever be able to learn it, and definitely not me. In the course of the workshop, I discovered that day that I was wrong on all counts! I apprenticed with Bob and visited him often. We would spend hours talking about his work. I asked endless questions, trying to understand what made him so much more powerful than the people he was training. Over time, I was able to glean some of his secrets, and eventually discover many of my own. One day when I arrived home, I found that a friend had brought a rabbit and let it loose in the living room. I thought this was very cute until I discovered pellets all over the carpet and decided to place Mr. Rabbit back in his box. When I finally cornered him and had my hands on his back, I could feel it trembling so I decided to try Quantum-Touch on him. To my amazement, within seconds, the rabbit stopped trembling. About 30 seconds later the rabbit stretched out on its stomach with the front legs pulled forward and the back ones back as far as it could stretch. My friend watched this in amazement. Then all of a sudden, the rabbit pushed against my hands and flipped itself over onto its back and stretched out as if it were sunning itself on the beach. In 1996, Bob asked me if I would take over in his retirement to bring this work out into the world. I’ ve helped it to evolve and gave it the name, “Quantum-Touch." The beautiful life-shocks continue to this day!!! The more I use this work, the more amazed I am. The miraculous discoveries in store for people practicing Quantum-Touch never seem to end. Quantum-Touch works on organs, glands and systems of the body, as well as on injury and inflammation. Everyone taking a live workshop or a video workshop will be able to see that bones align themselves with only a light touch. Quantum-Touch also works to balance emotions since the body does not differentiate between physical and emotional problems. We even have fantastic results when using it for distant healing and on pets. In principal, the body heals itself, and by raising the energetic vibration of the affected part being worked on, the body intelligence does what it needs to do to heal itself. The “healer” is always the person who was sick and got well. The practitioner is the person who can hold a field to support that healing. This is probably the easiest of skills to learn, and certainly one of the most important. But don’t just take my word for it, read the reviews about Quantum-Touch. Or contact any of our certified practitioners or instructors and ask them about their experiences. I wrote a book that you can actually learn from. You can learn to start using Quantum-Touch within an hour. "Richard Gordon did not hold back when writing this book. He gives the complete method, clearly explained, and offers many options for creating a powerhouse of healing in your hands. I regard this book as essential reading for all parents and for practitioners of all the healing arts." It’s a great joy to use this work with animals as they usually respond amazingly quick. You can learn to do Quantum-Touch from the book. I’ve written it to be easily accessible and usable. The majority of people attending instructor or video workshops have started out with the book. These people become so excited by their results, that they went on to take a live workshop or video workshop to help bring the work even more alive. "Perhaps the most exciting part of Quantum-Touch is that it enables a lay person to develop the competence to help himself or herself - and others - quickly and easily." "Quantum-Touch appears to be the first technique that may truly allow us all to become healers. " Dr. C. Norman Shealy, MD., Ph. D.
"Quantum-Touch is a remarkably effective and easily learned method of generating powerful healing energy... I highly recommend this book." "As an attorney, my training has lead to a natural skepticism regarding so called "self-professed healers." After learning to do Quantum-Touch however, I discovered a technique for directing healing energy which not only works, but which can be learned by anyone. I have been able to relieve my brother's chronic back pain. My girlfriend's heart palpitations and allergies have also responded well to this energy work. I highly recommend this to anyone. " "Every time I apply Quantum-Touch, I am in awe of the results. It's amazing how quickly the pain in my patients is resolved in just a few minutes. " "In energy healing the healer functions as a focusing lens for bioenergy, drawing such energy in and focussing that energy into the energy field of the person seeking healing. It is important for that lens to be as clear as possible. In its simplicity, Quantum-Touch slips past the healer's ego. This has the effect of increasing the clarity of the healer as a focussing lens. This effect makes Quantum-Touch a useful adjunct to other energy healing techniques as well as an excellent healing technique by itself. In its elegance, Quantum-Touch provides healing bioenergy for the healer as well as for the person seeking healing. Quantum-Touch could well be the current state of the art technique in energy healing. " "Quantum-Touch is an easily learnable skill that can provide balance, healing, comfort, and postural realignment. 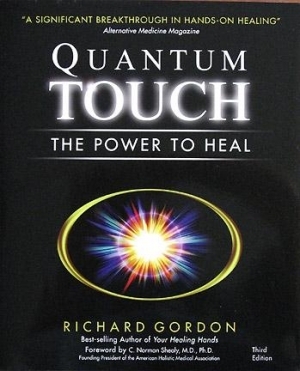 I salute Richard Gordon 's unique gift for making difficult concepts readily accessible, and for his commitment to bringing this work to the world "
"Quantum-Touch is an amazing method of healing - amazing because of its simplicity to learn. You already posses the tools necessary to practice it and it works!" "I love Quantum-Touch. I have dealt with energy medicine for many years since first studying polarity therapy, and Quantum-Touch is an exaltation of energy work. I use Quantum-Touch with my patients and family with excellent results." "Richard Gordon throws open the doors of energy healing for everyone. Simple techniques, profound results. Quantum-Touch is a system that anyone can learn quickly and put to use in their own lives." "Quantum-Touch accesses energy at a core level to promote surprisingly quick and effective healing. I highly recommend this method." "Quantum-Touch makes a wonderfully powerful system readily and easily available to all. This book is a gift of illumination." "Richard Gordon has an unsurpassed ability for explaining energy healing to novices and professionals alike. Richard's first book, "Your Healing Hands - The Polarity Experience," showed many of us how to use healing energy in our daily lives. Now Richard takes us on an even deeper journey, showing us how to activate the most profound levels of healing. He masterfully weaves together the story of his discoveries of Quantum-Touch with exceptionally clear illustrations that make it easy for anyone to learn this inspiring new technique. This book is invaluable to all health professionals. For the researcher, the phenomenon of Quantum-Touch represents an opportunity far too important to pass up." "For energy medicine practitioners, Quantum-Touch amplifies the effects of Reiki and other hands-on-healing techniques. For the layman, Quantum-Touch empowers the individual to tap into the innate healing abilities we all possess." "Quantum-Touch is amazing! In just two days it successfully unfroze my shoulder that had not responded to several months of physical therapy and other healing modalities. It has now become an integral part of my practice and I would strongly recommend that everyone learn this easy and powerful technique." "Quantum-Touch quickly and easily enables ordinary people to powerfully focus and amplify the life-force energy to become extraordinarily effective hands-on healers. For those who practice polarity therapy, massage or therapeutic touch, your work can take on an astounding new dimension." "Far better than chiropractic, physical therapy, or medication, Quantum-Touch has completely relieved my chronic back pain. Quantum-Touch is a valuable asset to nurses who want to take a step forward in their careers and work on a much higher level. This should be studied in every nursing school across the country. Quantum-Touch is what is needed to transform the limited way nursing is currently practiced." "When I combine Quantum-Touch with Reiki or Cranial Sacral therapy, my results are far more effective. Quantum-Touch awakens the magic in your hands." "Quantum-Touch is easy to learn, has a significant impact on the body's energy system and can make profound shifts in people's lives."